4. CAL is keen to give oral evidence to the Transport Committee about the risk that the Olympic Route Network (ORN) will cause breaches of air quality laws in London and make recommendations. 5. This submission relates primarily to the ORN. It summarises the key health impacts of poor air quality and legal issues most relevant to the OTP. 6. It highlights the legal requirements to ensure: the particulate matter (PM10) daily and annual mean limit values are not exceeded in London (or elsewhere) in 2012 (e.g. no more than 35 ‘Bad Air Days’ when 12 have been reported already along the ORN at Upper Thames Street); the nitrogen dioxide (NO2) hourly and annual mean limit values are not to be exceeded where they have previously been attained (e.g. in nearby roads); and NO2 levels are not worsened by the OTP and/or ORN where levels of air pollution are currently breaching legal limits (e.g. along much of the ORN in central London). 7. It highlights admissions in the Strategic Environmental Assessment (SEA) of the Olympic Transport Plan in February 2011 that air quality laws were expected to be breached as a result of the OTP. Also repeated assurances from Transport for London (TfL) since October 2011 that an up to date analysis of the environmental impacts of the ORN would be provided to CAL together with details of mitigation measures. These are still awaited. 8. Separately, CAL has urged the European Commission (Commission) to launch infraction action against the UK well before the Olympics for breaching the PM10 daily limit value and the NO2 annual mean and hourly limit values in London including along the ORN in earlier years. 9. This submission makes recommendations for the mitigation of air pollution during the Games. 10. Ambient or outdoor air pollution comprises particles and gases. The particles, which can comprise anything from tiny droplets to diesel soot and tyre and brake wear, are called ‘particulate matter’ and classified by their aerodynamic diameter in microns (one-millionth of a metre (µm) which is about one-hundredth of the thickness of a human hair) e.g. PM2.5 and PM10. The gases, which can coalesce and become particles, are mainly NO2, ozone (O3) and sulphur dioxide (SO2). 11. The WHO says there is little evidence to suggest a threshold below which no adverse health effects would be anticipated for particulate matter or, put another way, there is no safe level of human exposure to it. NO2 is a product of combustion processes and is generally found in the atmosphere in close association with other primary pollutants, including ultrafine particles. NO2 is not ‘just’ a molecule. 12. In the Great Smog of December 1952 there were 4,075 deaths in London due to short-term exposure to air pollution with more over the following months. The number was easy to calculate through time-series analysis i.e. the number of deaths peaked about two days after air pollution levels peaked (and didn’t fall into a trough thereafter). 13. It was not until 1995 and 2000 that huge cohort studies (which followed a group of people over a period of time to determine the absolute risk of one or more health impacts) in cities in the United States with different annual mean concentrations of PM2.5 showed the health impact of long-term exposure to air pollution. 14. Mayor Johnson was the first politician to use advice from the Committee on the Medical Effects of Air Pollution (COMEAP) in 2009 to publish in June 2010 estimates by ward of 4,267 deaths in London in 2008 attributable to long-term exposure to PM2.5. COMEAP lead the way nationally in December 2010 by estimating, using the language used for alcoholism, obesity and smoking, 29,000 deaths in the UK in 2008 attributable to long-term exposure to PM2.5 at an average loss of life for these people of about 11.5 years. COMEAP and the Mayor’s estimates were calculated after eliminating the effect of dozens of other possible risk factors (e.g. educational status as a surrogate for income and smoking) to produce a pure number assuming air pollution is the sole cause of those deaths. 15. It is fair to point out there were as many early deaths in London in 2008 attributable to long-term exposure to PM2.5 as we thought occurred during the Great Smog of 1952 (due to short-term exposure to air pollution when we knew nothing of the long-term effects). 17. These scientists were reported as saying that if we have still hot days, long distance athletes, like marathon runners and cyclists who breathe very hard, could feel a tightness in their chest or experience ‘coughs, breathlessness or other problems’. Those with asthma may need medication. Athletic performance could be affected. 18. It is not just about Olympic athletes though. In the “Summer Smog” of 2003, the Government estimated 46 to 212 early deaths in London attributable to ozone and 85 attributable to short-term exposure to PM10. 19. Beijing has much higher levels of airborne particles than London but London has the highest levels of NO2 of all 27 capital cities in Europe and levels comparable with those in Beijing before it took action to ensure the success of the 2008 Olympics. 20. The Mayor of London estimated in his Air Quality Strategy that road transport contributed around 80% of PM2.5 emissions in London in 2008 (page 41). 21. Air quality laws are breached every day by a factor or two or more along London’s busiest roads (and elsewhere) including along the ORN. No other public health or environmental standard is breached on such a large scale with such serious consequences for public health. 23. These are not new laws. An Air Quality Framework Directive (Council Directive 1996/62/EC), covering ambient air quality assessment and management, entered legislation in 1996. It was followed in 1999 by a so-called First Daughter Directive (Council Directive 1999/30/EC) which set limit values for various pollutants including NO2 and PM10 and thresholds for assessing and managing air quality for the pollutants concerned. Since 1999 therefore, limit values to be attained and not exceeded have been: an annual mean of 40 µg/m3 and not more than 35 days over 50 µg/m3 for PM10 from 1 January 2005; and an annual mean of 40 µg/m3 and not more than 18 hours over 200 µg/m3 for NO2 from 1 January 2010. In other words, the legal limits for PM10 are up to twice WHO guidelines whereas those for NO2 are aligned with WHO guidelines. 24. Directive 2008/50/EC entered into force on 11 June 2008. Amongst other things, it set new standards for fine particles (PM2.5) to be achieved by 2015 and 2020 and allowed Member States to apply for a time extension to comply with limit values for PM10 and NO2. Time extensions can only be obtained if a Member State meets strict conditions including demonstrating that compliance with the limit values will be achieved by the new deadline. The latest deadline possible for PM10 was 11 June 2011. After two failed attempts to obtain a time extension, the UK obtained unlawfully a time extension until 11 June 2011 to comply with the PM10 daily limit value in London after submitting an updated air quality plan to the Commission without consulting the public on it. The good news for public health is that no further time extension or breach of the PM10 annual and daily limit values is allowed in London (or elsewhere). 25. The latest deadline possible for NO2 is 1 January 2015. The Government has said it can’t (or won’t) comply with the NO2 limit values in London until 2025 and so is unable to meet a basic condition of a time extension i.e. to demonstrate compliance by no later than 1 January 2015. 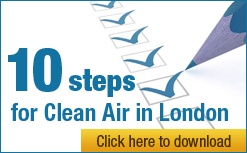 In fact, Mayor Johnson listed 14 measures in his Air Quality Strategy published in 2010 to show that the NO2 limit values could be complied with by 2015 if Government support was forthcoming. Even if a time extension for NO2 were to be obtained in future, another requirement of Directive 2008/50/EC is that the limit value plus margin of tolerance must not be exceeded during the period of a time extension i.e. an annual mean of 60 µg/m3 and no more than 18 hours over 300 µg/m3. Annex III of Directive 2008/50/EC emphasises that limit values apply everywhere in ambient air unless: the public do not have access; or all relevant provisions concerning health and safety at work apply. 26. Air quality laws can be enforced by the Court of Justice of the European Union (CJEU) and in the UK Courts. The former involves the European Commission in a five stage legal (or infraction) process: (i) Letter of Formal Notice (first written warning); (ii) Reasoned Opinion (second and/or final written warning which the UK had reached for PM10 before it obtained a time extension in 2011); (iii) reference to the CJEU requesting a judgement that the Member State is in breach and must comply; (iv) Letter of Formal Notice; and (v) reference to the CJEU requesting the imposition on the Member State of lump sum and daily fines. The Mayor of London has estimated that such fines, which could be passed to London under the Localism Act 2011, could total £300 million per year for each of PM10 and NO2. CAL considers that fines (or gaol) are a necessary final sanction in any legal system. 27. CAL has urged the Commission to launch infraction action against the UK well before the Olympics for breaching the PM10 daily limit value and the NO2 annual mean and hourly limit values in London including along the ORN in earlier years. 31. CAL has exchanged several letters with TfL since then dated 18 October, 8 December and 21 December (from TfL) and 8 November and 12 December (from CAL). CAL would be pleased to share those letters with the Transport Committee. In essence, TfL has promised in each letter since last October to provide CAL with details of the environmental impacts of the ORN and the mitigation of them. These are still awaited. King’s College London did similar analysis assessing the impact of the removal of the western extension of the congestion charging zone in 2010. By 26 February 2011 there had been five Bad Air Days at Upper Thames Street and 15 in Marylebone Road (with 14 recorded by the FDMS monitor at Marylebone Road). This section highlights the legal requirements to ensure: the PM10 daily and annual mean limit values are not exceeded in London (or elsewhere) in 2012 (e.g. no more than 35 ‘Bad Air Days’ when 12 have been reported already along the ORN at Upper Thames Street); the NO2 hourly and annual mean limit values are not to be exceeded where they have previously been attained (e.g. in nearby roads); and NO2 levels are not worsened by the OTP and/or ORN where levels of air pollution are currently breaching legal limits (e.g. along much of the ORN in central London). 33. Olympic Travel Demand Management (TDM) measures typically include: travel capacity creation measures; travel behaviour change/marketing; traffic efficiency measures; traffic bans; and an emphasis on public transport. “Overall, it has been estimated that the Games will lead to a nearly 30% reduction in traffic flows on the ORN and PRN and about five per cent additional road traffic elsewhere, although it should be noted that this is at a time of year where traffic levels, particularly in London, are typically lower than average. “In addition, evidence from the Sydney 2000 Games indicates that there was also a reduction in background travel demand during the period of the Olympic Games and Paralympic Games. It has been noted in this respect that ‘a successful travel demand management programme (TDM)… resulted in a notable decrease of background travel in Sydney during the Games. This was largely achieved through a patient and well-orientated pre-Games communications campaign, aimed at citizens, potentially affected residents, local commerce and large businesses’. Such demand management will also be a feature of the London 2012 Transport Plan. On this basis, therefore it is not anticipated that there would be an overall increase in traffic flows and vehicle kilometres during the period that the Transport Plan is operational.” CAL emphasis. CAL understands that a 30% reduction in non-Games Family traffic would be exceptional during the Olympic Games. In any event, because it depends on the use of the ‘Big Scare’ to manage people’s expectations such reductions are unlikely to be achieved in London given the ‘cat is out of the bag’. Some sort of large scale traffic bans or restrictions therefore seem inevitable for London. Beijing and Athens both imposed ‘odd and even’ number plate bans. At the moment, it seems Mayor Johnson’s plan is to use dust suppressants on roads in front of official air quality monitors during the Olympic and Paralympic Games to reduce local air pollution and ensure compliance with the PM10 daily limit value in London. Even this approach, which would humiliate London in front of the world’s media, would do nothing to ensure compliance with NO2 limit values or avoid the worsening of unlawful levels of air pollution. It seems there is no convincing plan yet to ensure the Olympic Transport Plan and ORN in particular will not cause breaches of air quality laws. Introduce a strict low emission zone or ‘Clean Air Zone’ that bans the most polluting heavy and light diesel vehicles from the most polluted parts of London. CAL has called for such action for years. The alternative is an ‘odd and even’ number plate ban which would affect all drivers equally e.g. including zero tailpipe emission vehicles; and Develop a contingency strategy detailing short-term measures to be taken if air quality standards (e.g. Bad Air Days) are likely to be exceeded during the Games period or 2012. 35. CAL considers alerts and/or public warnings should also be given where smog episodes occur. 36. CAL considers that London should be leading the world in tackling air pollution as it did after the Great Smog of 1952. Currently, this looks unlikely.